So, you’ve seen, no doubt, those shipping containers that get stacked up on cargo ship and loaded onto train cars. Those steel structures designed to hold precious cargo and withstand ferocious Ocean storms are, it turns out, easy to buy. A 45’ long storage container in good condition can go for around $3500. They come in a variety of lengths, some as little as 20’. Well, that’s fine you say, but you can’t live in one. Well, actually, people do. It’s a thing. Commonly done. 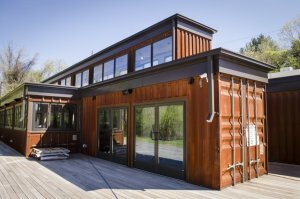 They are a quick and easy way to get a solid structure you can turn into a home. Take a few of them and stack them in some ingenious way to make a modern structure and there you have it. Cut some windows. Put in some insulation, paneling, flooring and wiring and you can have a solid residence for a fraction of the price and effort. Sounds awful? Well, okay, but they don’t look awful. 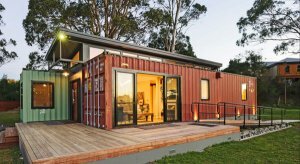 Do a quick google or instagram search for Cargo Container Homes or Shipping Container Homes and you may just be impressed.